Antonitte came to American Indian OIC’s Takoda Institute in 2012. She was a single mother looking to prove to herself that any situation could be made better, so she enrolled in the vocational school’s nine-month Administrative Assistant training program. While enrolled, Antonitte learned applicable work skills like project management, keyboarding, and database management and gained hands-on field experience by completing an internship with the Minnesota Visiting Nurse Agency. After her graduation, Antonitte obtained a position as a human resources assistant. She worked in that position for a year before she realized that she missed working in the healthcare environment that she was exposed to during her Takoda Institute internship. Antonitte then came back to the school to complete Takoda’s six-month Health Information training. 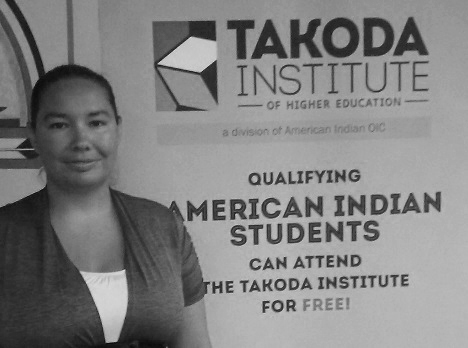 She completed the program on a Vape/Gorney/Bellecourt scholarship, which is a newly established scholarship that allows any student of Native descent to attend the Takoda Institute at no out-of-pocket costs. Armed with considerable classroom and on-the-job training, Antonitte was now well-prepared to make a better life for her daughter and herself. As she was wrapping up the Health Information training, she worked diligently with her Takoda Institute career counselor to obtain employment in her field. Her counselor helped her develop her cover letter and resume and helped her search for job opportunities. Just a few weeks after her graduation, Takoda’s career services team referred her to an open position at a nearby clinic. She was hired and now works full-time for Indian Health Board as a health program support technician. She assists their Diabetes Management program where she helps cook healthy meals and performs administrative work like preparing materials for patients. She appreciates the opportunity to help the community navigate the obstacles and barriers that life presents.